This is a combined giveaway of two gifts from Earth Mama Angel Baby: our first-prize winner wiill receive the Mama's Postpartum Recovery Essentials Bundle, a $49 set; a second-prize winner will receive the Postpartum Bath Herbs from the bundle, available for $5.95. Two lucky readers will win one gift each, making this giveaway's total value $55! Earth Angel Mama Baby's postpartum products are gentle and organic herbal blends that help soothe you back into health after a birth. Earth Mama Angel Baby's (EMAB) beliefs about pregnancy and birth will resonate with my readers - they are guided by a "sincere faith in the natural process of birthing babies." 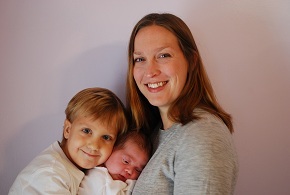 Their products are created to support mamas and babies naturally with nature's gifts. EMAB uses "the highest-quality, certified-organic or organically grown herbs and oils for our teas, bath herbs, gentle handmade soaps, salves, lotions and massage oils. [Their] products are 100% toxin-free, cruelty-free, vegan, and free from all artificial preservatives, fragrances and dyes." EMAB does everything it can to "honor the earth and her valuable resources…. [They] use only eco-friendly recyclable or reused/reusable packaging and packing materials." They have even won an award from the Business Recycling Award Group for their green practices. What does all that mean for you? It means that Earth Mama Angel Baby is committed to creating products that are good for you and your baby. 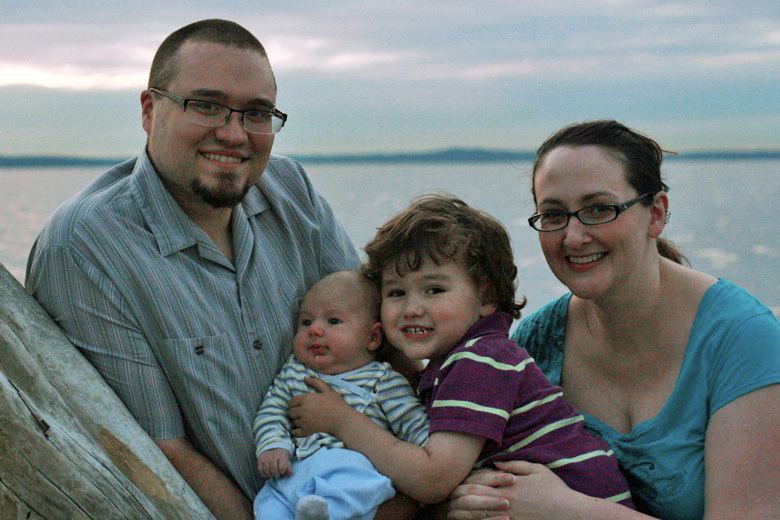 I happen to know one of the mamas who works with EMAB - Alicia of The Soft Landing - and I am confident that she and the rest of EMAB are genuinely passionate about mamas and babies! "Mama’s Postpartum Recovery Essentials safely and naturally addresses all the unpleasantries a new mama might be experiencing, like prenatal and postpartum hemorrhoids, episiotomies, cramping, postpartum vaginal swelling and bruising." Of everything included in the bundle, this was my absolute favorite. Admittedly, Ailia's birth was pretty easy on my body. I had no tears and only minor bruising and skid marks. For those of you who have it worse (and I remember how bad it can be from my extensive bruising, swelling and skid marks with Kieran! ), the balm helps everything: prenatal and postpartum hemorrhoids, postpartum vaginal swelling and bruising, episiotomies. My postpartum pain was made infinitely better when I used the Mama Bottom Balm. It soothes and cools your nether regions and promotes healing. Mama Bottom Balm contains an organic olive oil base infused with healing organic herbs - St. Johns wort, yarrow, Witch hazel, Calendula, Shea butter, and more. You can keep it in the fridge for added coolness and relief. Mama Bottom Balm should be on every expectant mama's must have list! Bonus - both the spray and the balm should also work on diaper rash for little ones! Here's a tip: give yourself a day or two after birth, then put a kid's floatie on the bottom of the tub, run some hot water, and throw in one or two of EMAB's bath herb pads. Climb in, sit back, and say ahhhhhhh. "100% Organic Postpartum Bath Herbs is a soothing, comforting blend includes salts, oatmeal and organic herbs that have historically been used to support postpartum women. Wound-healing, styptic and antibacterial herbs and salts help reduce swelling and speed healing of vaginal soreness, episiotomy and perineal bruising. Great for both prenatal and postpartum hemorrhoids too." Happy Mama Spray is a light, refreshing spray that will surely be a hit to both pregnant and new mamas, as well as their little ones. The blend includes lime and ginger pure essential oils, and "there are no chemical fixatives to make the fragrance last an artificially long time." That means you can put a spritz on your wrist (or your toddler's) for a quick pick-me-up and inhale without worrying about artificial ingredients. I've often used this spray to freshen up our bedroom and sheets - it makes climbing under the covers that much more enjoyable. This tea's "100% Organic and Certified Kosher blend [was] created to jumpstart recovery immediately after childbirth, and for "that time of the month" when hormones are raging and your uterus and you could use some extra care!" This set would make a wonderful gift for any expectant mama, but if your budget is more limited, I'd highly suggest the Mama Bottom Balm. With Alrik's pregnancy, I was a little frantic when his birth was approaching and I didn't have any herbs ready for postpartum use. Earth Mama Angel Baby to the rescue! These pads were really interesting. I had thought you'd just use them in the bath, and you could — but the directions actually recommend putting them right against your skin. I liked that thought, having the beneficial herbs making direct contact, so my sister-in-law helped brew some up for me in the first few days after the birth. Once again, I didn't have extensive damage, but I did have one unfortunately jagged tear that required stitching. Plus, everything just felt a bit out of place for awhile, so I was glad to have time to rest and heal. You steep the herbal pads like you would tea bags, and then you can either use them slightly cooled, or freeze them to give your bottom even more of an "ahh" sensation. My one complaint was that the pads are very delicate, particularly once they've been steeped. I tried to reuse one that had been in my underpants by tossing it into the bath, and it immediately burst apart. That was all right — there's nothing wrong with an herb-strewn bath (except for the cleanup). You have to be extremely gentle not to burst the pads when handling them, so warn any postpartum helpers. You can order the Postpartum Recovery Essentials Bundle, or any of EMAB's pampering products at their website. You can also find EMAB products on Amazon. 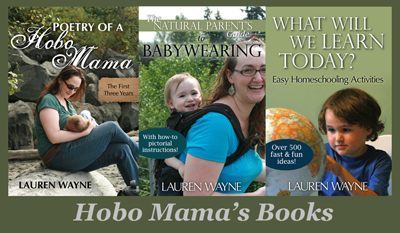 This is a joint giveaway with Code Name: Mama, Hobo Mama, and Natural Parents Network. You may enter at one site only, and we'll be recording IP addresses to ensure that there are no duplicate entries. That said, please do visit and enjoy all three sites! 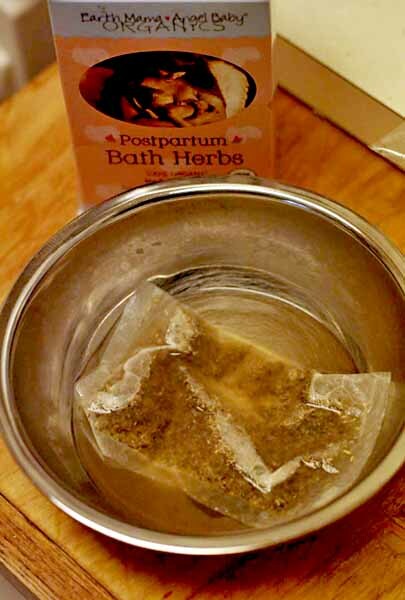 I would love to try the Postpartum Recovery Bath Herbs! I am currently almost 39 weeks pregnant w/ my 2nd full-term baby. I have a feeling these will come in very handy after her birth. I'd love to try the new mama bottom spray. 2nd baby is due next month and it sounds very soothing! I'd like to try the Breastfeeding Essentials Bundle. It will be my first time breastfeeding and anything would be helpful. I learned that Earth Mama are recipients of the BRAG (Business Recycling Award Group) for our green practices. I learned that EMAB is 10 years old! And the employees include doulas, and childbirth educators and others who support birthing moms. I'd like to try the Happy Mama Spray! I learned that EMBA recently had its 10th birthday. I want the Postpartum Bath Herbs. I learned that their products are certified vegan! No animal products or animal testing! I would like to try the http://www.earthmamaangelbaby.com/postpartum-recovery/mama-bottom-balm.html. I would like to try their baby lotion. I learned that they practice no animal testing or animal practice.